Background: Acquired immunodeficiency Syndrome (AIDS) is caused by Human immunodeficiency virus type 1 (HIV-1). Pyrazine and Thiazolidinone pharmacophore has diverse biological activities including anti HIV activity. Aims and Objectives: To study binding behavior of Pyrazine- thiazolidinone derivatives on four different crystal structures of HIV- 1RT.These molecules which were already reported as anti-TB were investigated for dual activity as Anti-HIV and Anti-TB. Materials and Methods: In the present study we describe a comparative docking study of twentythree derivatives of N-(4-oxo-2 substituted thiazolidin-3-yl) pyrazine-2-carbohydrazide. 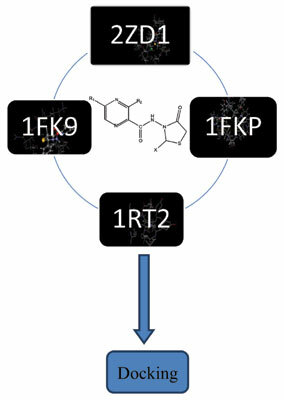 Binding pattern of these derivatives was gauged by molecular docking studies on four different receptors bearing PDB code 1ZD1, 1RT2, 1FKP and 1FK9 of HIV–RT enzyme using V. Life MDS software Genetic algorithm docking method. Result and Discussion: The studies revealed hydrogen bonds, hydrophobic interaction and pi-pi interactions playing significant role in binding of the molecules to the enzyme. Conclusion: Most of the molecules have shown good dock score and binding energy with anti-HIV receptors but Molecules 13 and 14 have potential to act as anti-tubercular and Anti HIV and hence can be further explored for dual activity. Keywords: Docking, pyrazine, thiazolidinone, anti-HIV, NNRTI, HIV-RT. Keywords:Docking, pyrazine, thiazolidinone, anti-HIV, NNRTI, HIV-RT.